What does the Bible say about forgiveness and thanksgiving? What does it say about loneliness and depression? What verses would you use to share your faith or answer difficult questions about other world religions? Where in the Bible would you find answers about your purpose in life? We know the Word of God has the answers to all of these topics and so many more, but oftentimes we don't know where to find them. 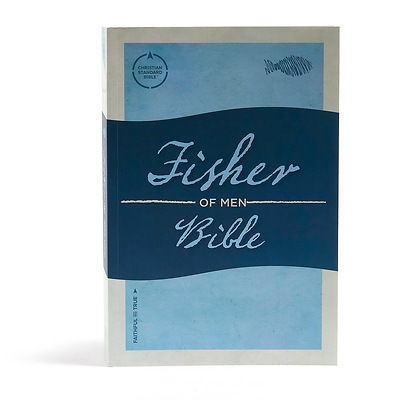 From felt-need topics such as marriage, finances, and forgiveness to spiritual growth topics like apologetics and Christian doctrine, The CSB Fisher of Men Bible guides you to the first verse in a chain of a particular topic. There you will find a brief commentary as well as the second reference verse in the chain. Most chains have 4-5 Bible verses. The CSB Fisher of Men Bible features the highly readable, highly reliable text of the Christian Standard Bible(R) (CSB). The CSB stays as literal as possible to the Bible's original meaning without sacrificing clarity, making it easier to engage with Scripture's life-transforming message and to share it with others.